So TGI Friday’s has discontinued the only reason I ever went there: their sublime, summer strawberry shortcake. I cannot live without it though, so I refused to come out of my kitchen until I had perfected my own version. This is it, only better (and, I’m sure, far healthier). A true shortcake is not a sponge, pound, or angel food cake, but a dense, sweetened biscuit that can stand up to the juice and tartness of berries. Mentioned in Shakespeare’s The Merry Wives of Windsor, the shortcake has been a dessert staple since the 16th century perhaps because of its easily customizable creation. 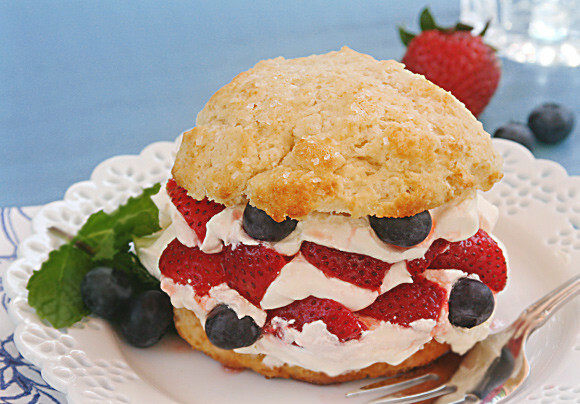 Allowing your guests to customize their own shortcake is key for a quick, easy summer dessert spread. All you have to do is bake the shortcakes ahead of time (they freeze beautifully as well! ), and then set them out with bowls of whipped topping, ice cream, and an assortment of berries. Every person can then assemble their own and add as much (or as little) of each filling as they wish based on their personal preferences and dietary needs. That way, you’ll have a roomful of adoring fans who will swear this is the best shortcake they’ve ever had (because with its sweet, crispy top and soft, buttery center, it will be!) in half the time and with half the work of you assembling each plate yourself. 2. Combine sugar, flour, baking powder, baking soda, and salt in large bowl. Cut 6 tablespoons butter into small chunks. Add to dry mixture and combine using a pastry blender until coarse crumbs are evenly formed throughout. 3. Add buttermilk and stir gently with fork, scraping down the sides of the bowl until dough is wet throughout. Do not overmix. Dough will be very wet and very sticky. 4. Drop dough ball onto a lightly floured surface. With floured fingers, gently pat dough until 3/4 inch thick. Lightly grease the top edge of a drinking glass, and use to cut shortcakes out of dough. Place rounds on lightly greased baking pan very close together. Gather remaining scraps and form into final 1 or 2 shortcakes. 5. Melt remaining 1 tablespoon butter and brush over top of shortcakes. Sprinkle with sanding sugar. Bake 15 to 17 minutes until shortcakes just start to golden. Remove from oven and cool on wire rack. 6. Cut shortcakes in half horizontally, and serve with bowls of toppings of your choice. The less you handle the shortcake dough, the fluffier the end result will be. To keep the shortcakes from burning on the bottom, use a light-colored or glass pan, and move oven rack to highest setting. For a reduced calorie version, use low-fat buttermilk and low- or non-fat whipped topping and ice cream. In a medium bowl, toss strawberries with 1/4 cup sugar and vanilla. Let berries sit for 10 minutes. For an even juicier filling, add 2 tablespoons water and smash berries. Please add a button for emailing your recipes. This looks delicious. This is very much like the New England old fashioned strawberry shortcake, but I must admit, I like your recipe better. When I first met my husband he invited me for dinner and his mother made a strawberry shortcake. Being from an Italian family, I expected a big cake. Instead his mother served this muffin type cake. I was definitely surprised! I will absolutely try this! !